Everyone’s perception of what is a good ride can vary. So we employed the butts of more than a few folks. We spent over 1 year and more than 25,000 miles testing a wide array of rear shocks. We also we spent time testing various shocks on a Shock Dynamometer, measuring compression, rebound, spring rates and travel. We used 2 Sportsters, 2 Dynas, a Street Glide, an Electra-Glide, and 2 Tri-Glides. We ran solo, 2-up, & loaded down with luggage. We have two “courses” that we ran through, slowly, at cruising speed, and fast. We also did several longer trips, ranging from 800 miles to 3,000 miles, both 1 up and 2 up. Another aspect of the testing is that when you go from one shock to another, you will notice some differences, but many times, when you go Back to the previous shock, you will pick up even more differences. Because of that, we tested each pair of shocks multiple times, before and after other shocks in the test. Riding two circuits, with straights, curves, smooth & bumpy surfaces. We rode thru the same curves & over the same bumps & dips under acceleration, cruising and braking conditions... 1 up, 2 up and loaded. On 2 wheeled bikes we paid close attention to “wallowing”, and on the Trikes we paid close attention to body roll, testing for stability in curves. For us it is important to be able to go as fast thru a curve as you want without having wallow or body roll being a limiting factor. What this translates to, in daily riding, is better control/safer operation in the curves, even at normal speeds. Another safety factor we tested for was rear tire/tires skidding when braking hard on roads that were not smooth. The better a shock functions, the better it stays in contact with the road, reducing the possibility of the rear tire/tires “locking up” when going over an imperfect surface. This is not particularly needed in everyday riding, but when it is time to do an emergency stop, it can make all the difference. One of the most important things we looked for in our testing was to make the small road imperfection disappear and to take all the harsh jolts and "round the edges", making them seem more like a small dip. We tested over 2 dozen different shocks, including all the popular brands/models. We test 11’, 12’, 13” & 14” shocks. We made the decision to not list the products we tested that produced less than favorable results, nor have we listed the products that were very expensive and produced results not significantly better than less expensive options. We have included a few of the more popular model shocks to give a point of reference when comparing. In all our testing, the stock shocks was consistently the least favourable. On the Sportster and Dyna the Twin Adjustable Bitubo and the Pro-Actions Street Series shocks were the best by a significant margin over shocks of similar and even higher price. In all our testing, the stock suspension was consistently the least favourable, and the TA & PA were the most favourable. For grading we used the stock as a reference # of 0, and the TA/PA as a reference # of 100. Everything else was awarded points between 0-100, based on how much better they are than stock, and how close they are to the most favorable shocks. On the Touring Models the Twin Adjustable Bitubo and the Pro-Actions Street Series shocks were again tied. However the Pro-Action/DK Custom Max-Travel™ 14” Shocks were significantly better when riding 2 up, 300 lbs+ 1 up, or even sub 300 lbs 1 up when it was a road with significant bumps. The only time when these 14” shocks were not better than the 13” Twin Adjustable or 13” Pro-Action is on 2 wheeled models, when it was with a 150-275 lbs rider on roads with no big bumps. For 2 up riding and heavier solo riders, the extra travel in the 14” shocks makes for a very noticeable improvement over the 13”. Important Note: The 14” Modified shocks require the use of a 1” Lowering Block to keep the ride height the same as stock. There are a few Touring Models that cannot utilize Lowering Blocks because of bag clearance issues. You can check fitment at this LINK. On the Trikes the Twin Adjustable Bitubo and the Pro-Actions Street Series shocks were tied, providing a significantly better ride quality than other shocks of similar and higher price. However, the 14” Trike Series Shocks were the better, in every instance. These are the first shocks that have been designed and built, from the ground up, for a Harley-Davidson Trike, and it shows in the ride quality and handling. The Trike Series Shocks valving and extra travel make a real world difference. Important Note: Regarding the Twin Adjustable and Pro-Action Shocks: We ran both shocks on all the bikes/trikes, with multiple people test riding them. The ride quality is indistinguishable between the two. We did blind tests, and it was impossible to say that one rode better than the other. Important Note: Regarding all the shocks we tested, but did not list in our charts: Many were so poor in ride quality and/or handling, there was no reason to clutter the chart with them. 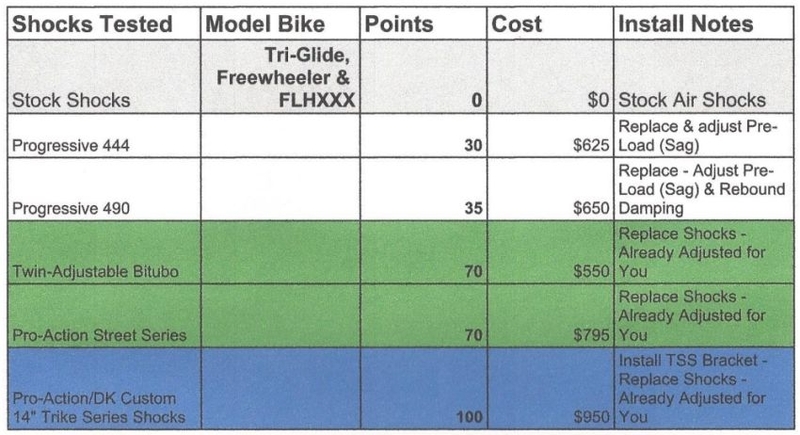 There were a few shocks we tested that provided a small incremental improvement in ride quality, but the cost of those shocks are north of $1,000.00, many in the $1500-$2000 range. We did not find small improvement (10-15 points) worth the 1.5 - 3.5 times the price difference. 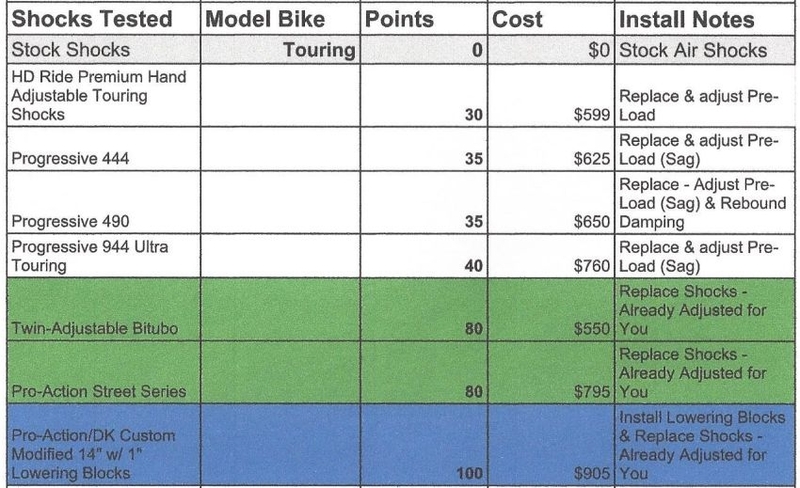 *All prices listed in the chart are Retail. Springs are to keep the bike at the desired height when sitting still, and to control (partially) the amount of compression when hitting a bump. Sag- How much the bike shocks settle (sag) when you sit on it. Example of what can happen when there is not enough sag- After the wheel passes over a bump, it can lose contact with the road for an instant...this is because there is not enough rebound length for the shock to extend back down, enabling the tire to stay in contact with the road. This is not such a big deal when going straight, however, if in a corner when a bump is hit, it can be disconcerting to feel the rear tire/tires “skip” & then “catch”. If you’ve ever felt that, you know what I mean. If there is too much sag, then too much of the travel is used just by the weight of the bike and rider, leaving you with too little travel when riding, resulting in easily bottoming out. Every shock we tested had a pre-load adjuster (except the stock shocks), which enable for easy adjustment of Sag. On the Bitubo and Pro-Action shocks these are adjusted for you, based on your weight, prior to you receiving them, meaning a little less work for you when you receive them. However, it can still be adjusted if the need arises. Compression damping is what determines how fast or slow the shocks compress when the wheel encounters a bump. Too fast and the travel gets eaten up quickly, causing bottoming out on larger bumps. To slow and it makes for a bumpy, or jolting ride. Rebound damping is what determines how fast or slow the shocks return to “neutral” after the wheel passes over a bump. Too fast and you have a bumpy/bouncy ride, too slow and you can lose tire/road contact. 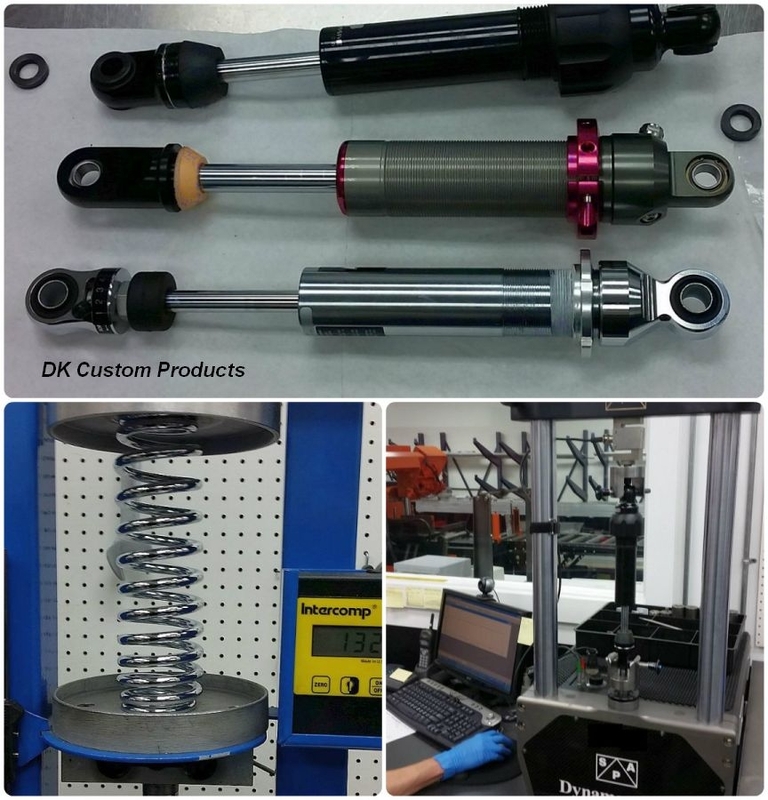 Some of the shocks we tested have rebound damping adjustment, allowing for fine-tuning of the damping in the shocks. Again, these are pre-set for you on the Bitubo and Pro-Actions shocks. But it is very easy to adjust them, should the need arise. Proper sag and damping keeps the shocks riding in the upper mid range of their travel, providing a comfortable ride, a stable & controlled ride, and more clearance (lean angle) in the curves. Emulsion- This is when the fluid and nitrogen are in the same chamber inside the shock. Internal Reservoir- This when the fluid and nitrogen are separated into their own internal chambers inside the shock. External Reservoir- This when the fluid and nitrogen are separated into their own internal chambers inside the shock. Additionally, there is a reservoir external to the shock where extra fluid and/or nitrogen is contained. External Reservoir shocks are used to keep the fluid cool in motocross bikes and racing bikes that see much more shock action than 99.9% of Harleys being ridden. An internal reservoir shock is traditionally viewed as a superior design in shocks, because of the separation of the fluid and nitrogen. About half the shocks we tested were Emulsion and half Internal Reservoir design, & even with aggressive riding, we did not notice any fading of the Emulsion shocks we tested. Pro-Action has a unique valving system that gives their emulsion shocks just as good compression and rebound damping as the Bitubo internal reservoir shock. 14” Trike Series Shock Technology. DK Custom Products partnered with Pro-Action Suspension to design a shock, from the ground up, specifically for Harley Davidson Trikes. We tested many variations until we got the performance where we wanted it. Since this shock is 14” instead of 13”, it includes a pair of Special Comfort Lift™ brackets that set the Trike 1.25” higher at the shocks on the 2016 and earlier models, and ⅞” higher at the shocks on the 2017 models. This levels out the Trike, giving more ground clearance for the mufflers, while cantilevering the shocks for a smoother ride, all combined with the additional travel of a 14” shock. The Max-Travel™ 14” Shocks for Touring Models is a variation on the 14” Trike Series Shock. After nailing the performance for the Trikes, we made a few changes, including using Lowering Blocks, that give Harley Touring Models more suspension travel than was previously available. Live Free - Ride Free!